We offer two different methods of decaffeination. The Indonesian Sumatra Mandheling, and the Decaf Foggy Morning are Swiss Water Process. The Colombian and Guatemalan are Methylene Chloride Process. Both processes have been proved to be 99% effective. Both processes have shown no residue in the coffee after roasting and brewing. Decaffeinated coffees are naturally darker in appearance. We roast and flavor the coffees to order so that you will enjoy the best and freshest coffee in Maine. This is our most popular decaffeinated varietal. It yields a cup indistinguishable from its caffeinated sister. Swiss water processed this decaf varietal is full bodied, deep and earthy. 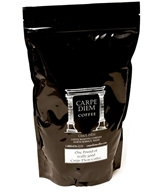 It stands well alone but when blended with other decaffeinated coffees adds a deep flavor.